Can you believe the 2014 season is half way over? After eight weeks, we've learned a lot about the league and who the studs are moving forward. However, one thing remains constant... Elite Quarterbacks are tough to find! Of the top 11 QBs through week eight, nine have been top stars for at least 4 years. The new guys to the bunch are Andrew Luck and Russell Wilson, who are expected to be in the top 11 for many years to come. 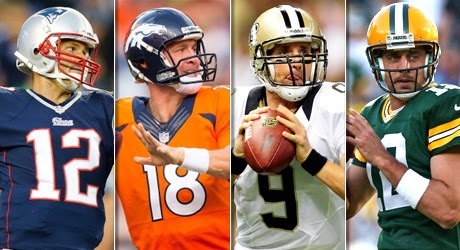 So take a look at what we've noticed about the superstar Quarterbacks so far this year. 2 Rodgers, Aaron GBP QB Tweaked his hamstring, but not to worry, he'll be fine. Having a splendid 2014. 3 Manning, Peyton DEN QB Manning could be unstoppable, he hasn't had a game under 20 points this year. 4 Rivers, Philip SDC QB Playing great in 2014. On pace for 46 TDs with three TDs in five of eight games this year. 5 Wilson, Russell SEA QB Doing plenty of damage with his legs, averaging 51 yards per game on the ground. 6 Cutler, Jay CHI QB Even with the Bears losing, Cutler is on pace for his best fantasy year ever. 8 Brady, Tom NEP QB This Patriot is on fire, leading the league with 26.8 pts per game over the last month. 9 Ryan, Matt ATL QB A lot of people are down on the Falcons QB, but Ryan is on pace for 4600 and 30 tds. 10 Stafford, Matthew DET QB Inconsistent this year, but Tate and Riddick are helping and Megatron is back soon. 11 Brees, Drew NOS QB Mr. Reliable as always. He's on pace for 5090 yards and 32 TDs.